On Monday, Wednesday and Thursday afternoon I'd climbed this hill in sunshine, only for a cloud to arrive and ruin the shot just as EZ45193 came round the bend. On Tuesday it had been raining heavily and I hadn't bothered getting out of the car. Finally, on the Friday afternoon, the sun stayed out, making all the effort worthwhile. 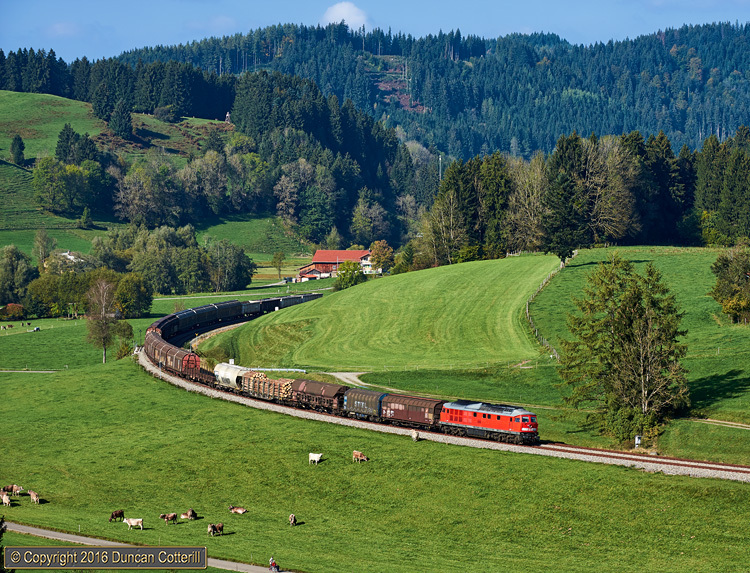 233.373 passed Oberthalhofen, north of Oberstaufen, with the diverted Buchs SG to Hallein freight on 3 October 2014.